Age discrimination is, unfortunately, still alive and well in the American workplace including California. For this reason, there are both state and federal laws that protect older workers from being terminated or having some other adverse employment action such as a demotion, reduction in pay or benefits or other similar negative workplace event take place due to being a senior worker. The Age Discrimination in Employment Act (ADEA) is a federal civil rights law that protects older workers from discrimination in employment. The United States Congress enacted this legislation specifically to address the problem of older workers being terminated due to senior status and having difficulty finding new employment. The ADEA is enforceable against all “employer” – defined as any industry affecting commerce that regularly employs 20 or more workers full time or part time. Certain Federal and State Government employers and religious institutions may be exempt from the law. The law defines an “employee” as any worker who is 40 years of age or older and is a regular employee (i.e. not an independent contractor, corporate official or partner of the business). The State of California has employment laws that are based upon the ADEA but, go even further in protecting employees who are 40 years old or older. The California Fair Employment and Housing Act (FEHA) protects older workers as a group and not just individually (i.e. it is possible to bring a class action for age discrimination in The Golden State). The FEHA applies to employers with five or more employees (See California Government Code 12926(d)) rather than the 20 required by the ADEA. 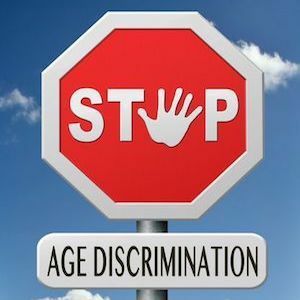 The FEHA also prohibits not just age discrimination but age-based harassment as well as well as retaliation related to age discrimination or harassment complaints. As an older worker, if you see any of the above taking place in your workplace in California, it should raise a “red flag.” However, getting from suspicion of age-based biased decisions to obtaining admissible evidence that can prove such a legal claim are two different things. These claims quite often require many hours of legal research and investigation to obtain sufficient facts to prove the case. It is always advisable to consult with an employment lawyer familiar with the laws of the State of California. Oftentimes, older workers are offered a “severance package” that can be pennies on the dollar to what they may be entitled as a “quick sell” by the employer. Senior employees should know that once they sign this type of agreement and assuming it has all the valid requirements including a 21 day waiting period, they may legally have waived any right to seek compensation. Compensation for age-related harassment, retaliation and/or discrimination in the workplace can include lost wages, lost future wages (unless and until the worker is able to find similar employment at a similar rate of pay and benefits), attorney’s fees and costs and, sometimes, even additional damages meant to punish the employer and discourage future, similar conduct. For these reasons, it is always advisable to seek legal counsel if you suspect you are the victim of age-related prejudice in the California workplace!